Corvette Racing driver and Europe’s Corvette ambassador, Oliver Gavin, have spoiled a grand surprise for tomorrow’s opening of the 2016 Geneva Motor Show. 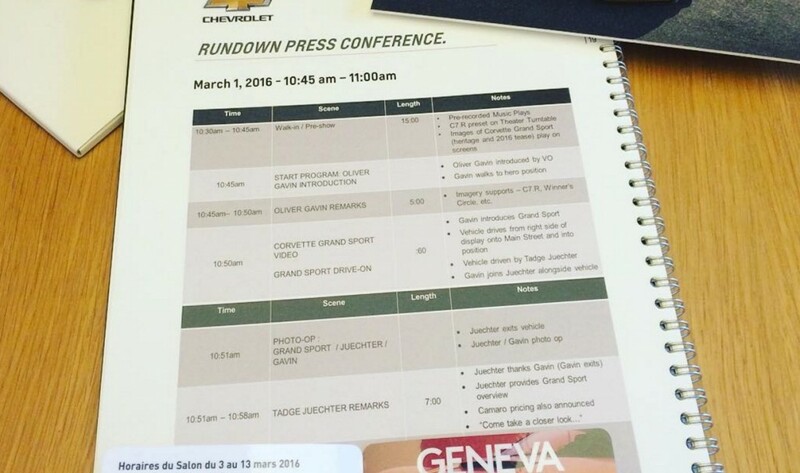 Gavin tweeted a full run-down of Chevy’s press conference schedule, which lists “Corvette Grand Sport” as part of the program, stating he was headed to a rehearsal for the world premiere of the Grand Sport. According to the schedule, Gavin will be joined by lead Corvette engineer Tadge Juechter for the debut. Photo included in Oliver Gavin’s Tweet. We’ll have to wait until tomorrow to understand what Chevrolet and the Corvette team have planned for a C7 Corvette Grand Sport. 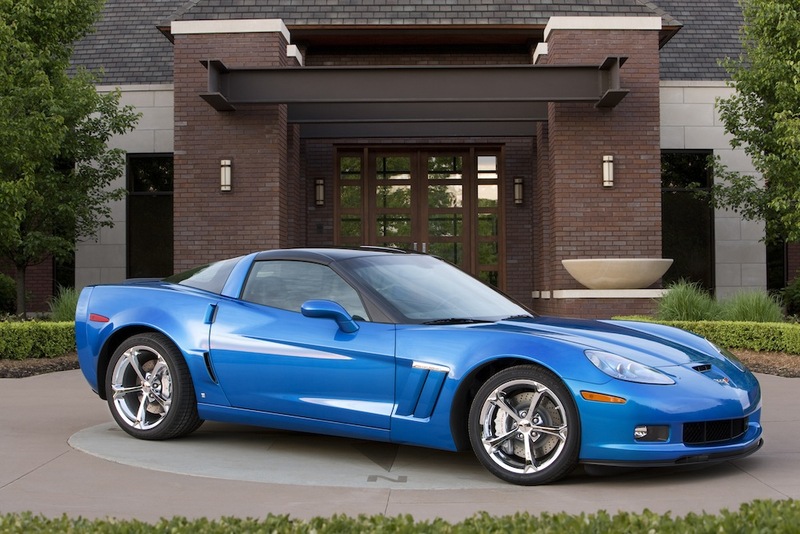 To note, the C6 Corvette Grand sport included iconic front-fender hashmarks, wide-body design elements from the Z06, along with some other performance and appearance upgrades. Those wondering why Chevy chose Geneva for the introduction should know that there is a historical element behind the decision. Chevrolet debuted the C4 Corvette ZR1 at Geneva, marking its return as a world-beating sports car. The Bowtie also used the show to introduce the Convertible variant of the C7 Corvette Stingray in 2013. NA LT7 with 535hp and 535tq u say? One can dream. I hope the rumors are true, I think there should be a Corvette C7 Grand Sport. I have a 2011 C6 Grand Sport and love it. Its a great combination of aggressive good looks, performance and reasonable pricing. I’m not a horse power junkie and don’t need 500 or 600 horse power. If you can’t get into trouble with 436 horse power and a 6 speed manual transmission, you just ain’t trying. Still, i dont need 650hp eithr, but, i love my 15 Z06. Wow. My 08 Z51 436hp convertable was great too. I’ve also had an 01 Convertible with a 350 HP LS1 and an 05 Coupe with a 400 HP LS2. I loved them all, but the 2011 Grand Sport is the best and my favorite. I may just keep it forever. Love my 2011 Jetstream Blue Grandsport and I will keep it forever. That being said I would still love to see a C7 Grandsport. 500hp NA hardtop with a trunk all with a loss of over 200lbs. Now that would be interesting. Have a 2010 3LT Grandsport, and have not upgraded to a C7 because I thought the Z06 was Just TOO Much Car. Really happy they are doing one! Can’t wait to order one. Since when is 455hp insufficient hp? :p The motortrend folks compared the viper to z06 to 911 gt3 rs and said that 650hp make the corvette unpredictable and a bit erratic on the track. I’d personally love to see the grand sport version of the car be more capable of putting the power down and being controllable.